Halloween is just around the corner and my two girls are so excited! This year, both girls want to be Harry Potter Hermione Granger. I've never watched Harry Potter so when they asked if I can buy them Hermione's costumes, I told them I'll think about it because I didn't want to promise them something and then wouldn't be able to honor it. I wanted to make sure that our local Halloween stores have Hermione's costumes. In the meantime, I asked my girls to think of another costume. Both were adamant they wanted to be Hermione this year. I checked online and found several websites selling Harry Potter's costumes. At first, I planned on buying just the black robes and thought they will suffice my daughters' request. I mean, they're only 8 and 4 years old. Boy was I dead wrong! They were detailed from hair to shoes. My 4 year old doesn't know much but once she hears her sister's list of Hermione's complete outfit, she wants it like so too. 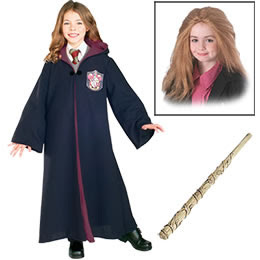 The complete outfit is the black robe, tie, white shirt, wand, tights, shoes, and wavy red hair. My brother suggested that we have a family pumpkin carving contest. That, of course, got my girls excited too. So I get the "when are we going to carve our pumpkins" question on top of "when are we going to get our shirts and shoes" question. I know as soon as Halloween is over, the next question will be "what are you going to get me for Christmas?". I never celebrate Halloween before over here...Always watch on movies that Halloween is with so much fun. I think I will be excited like your kids if I am still young and have the chance to attend any Halloween party. Halloween is a big deal in the US and other western countries. In the Philippines and probably elsewhere in Asia, Halloween is celebrated with solemnity and with reverence for the dead. We usually go to cemeteries to honor and remember our dead and for bonding with living members of our clans. There are also eating and a little merry making by the little ones but by far and large it is a solemn get together by all members of the clan . Thanks foir the post. God bless. Halloween is fun but we all need to be careful especially the young ones. Have fun! My kids go crazy for Halloween too. --> Superman, it's not too late to enjoy Halloween. Adults still can have fun! @Superman - My parents didn't let us go trick or treating when we were young citing "it's too dangerous". Now that I have kids, I can see what they meant. I only take my kids to the malls and around my neighborhood but never anywhere I'm not familiar with. @Mel - You are absolutely right on the dot on Halloween being not an Asian celebration. Many Asians dislike doing anything on this day too. My coworkers didn't participate in any activities relating to spirits and deaths. Growing up, I wasn't allowed to do anything on Halloween. I'm still guarded with my own kids, allowing them to go trick or treating in malls and around a few neighbors. @Sook - Hope your family will have a safe Halloween too! Nice to see while most girls want to be princesses and fairies, your's want to be wizards. Have fun trick or treating! @Happy: My girls have been princesses for the past couple of years, I think they got tired of it. At least they'll be warm in their wizard costumes!